Updated Aug. 1 at 5:54 p.m.
WASHINGTON — Maxar Technologies is setting up a new organization focused solely on small satellites while continuing to downsize its geostationary satellite manufacturing business at Space Systems Loral. Howard Lance, Maxar’s chief executive, said the company is still examining strategic alternatives for its business of building large multi-ton geostationary communications satellites — one of which is exiting that line of work altogether — but has not yet made a decision. Speaking July 31 on a conference call with analysts, Lance said Maxar is laying off staff in Palo Alto, California where SSL builds satellites of all sizes, while scaling up the new division in nearby San Jose, California to focus on smallsat work that is growing instead of shrinking. Lance didn’t say how many people Maxar plans to cut from SSL. Dario Zamarian, group president of SSL, told SpaceNews Aug. 1 that the company cut 5 percent of its workforce this summer. SSL did a previous round of layoffs last summer, also citing a weak satellite manufacturing market. Maxar reported a 3 percent decline in its company-wide space systems-related revenue for the months of April, May and June, a decrease slowed but not stopped by growth in smallsat work. Revenues were down roughly 18 percent year over year from geostationary, or GEO, communications satellites and the nearly finished construction of the Canadian government’s three-satellite Radarsat Constellation Mission bound for low Earth orbit on a SpaceX Falcon 9 this November. Lower space systems revenue dragged on Maxar’s overall financial performance for the quarter, which decreased 4 percent to $579 million (Maxar compared results as if its DigitalGlobe and MDA Corp. halves were already one company in 2017 to judge annual performance.) The company reported a net loss for the quarter of $18.6 million, compared to a $19.3 million profit for the same period in 2017. Lance said Maxar’s new smallsat division, so far unnamed, will focus on satellites ranging from 100 to roughly 500 kilograms. The San Jose facility “is much more appropriate for the overhead costs and physical structure requirements that smaller satellites need,” he said. GEO communications satellite orders split among all the world’s manufacturers will likely land around eight this year, Lance said, similar to last year. Historically satellite operators have purchased 20 or more GEO communications satellites from manufacturers, with SSL often claiming the lion’s share. “We do not believe at this point we will see much in the way of a market recovery for GEO,” Lance said. Satellite manufacturing demand is strong for low and medium Earth orbit spacecraft, which are typically smaller, while remaining GEO demand is coming mainly for replacement spacecraft, he said. These market conditions, he concluded, appear to be the new norm. The most significant smallsat revenue opportunity for Maxar is Canadian fleet operator Telesat’s LEO broadband constellation program, for which a team of Maxar and Thales Alenia Space received a contract yesterday to study system design and risk management. Lance said the Telesat-funded contract lasts for nine months, and that even though Thales Alenia Space is leading the study, Maxar and Thales Alenia Space are equal partners and should continue to be if they win the full 117-satellite constellation order. Lance said Maxar was willing to accept lower revenue as part of a team, versus a go-it-alone approach, for a better chance at winning the project. Telesat anticipates selecting a manufacturer in mid-2019. Maxar’s business backlog, which includes imagery and geospatial services alongside manufacturing spacecraft and spacecraft parts, stood at $3.05 billion as of June 30, down from $3.32 billion at the end of December 2017. The company reported a 5 percent increase in imagery revenue, up to $212 million compared to the same quarter last year, and a decrease of 3 percent in geospatial services to $66 million. Maxar said it anticipates more near-term spending on its $600 million WorldView Legion constellation of remote sensing satellites. Anil Wirasekara, Maxar’s interim chief financial officer, said most of the spending should take place from this year through 2020, after which the company will focus on paying down its $3.1 billion debt. SpaceX is scheduled to launch Maxar’s WorldView Legion constellation, about which the company has released few technical details, in 2021 using two pre-flown Falcon 9 rockets. 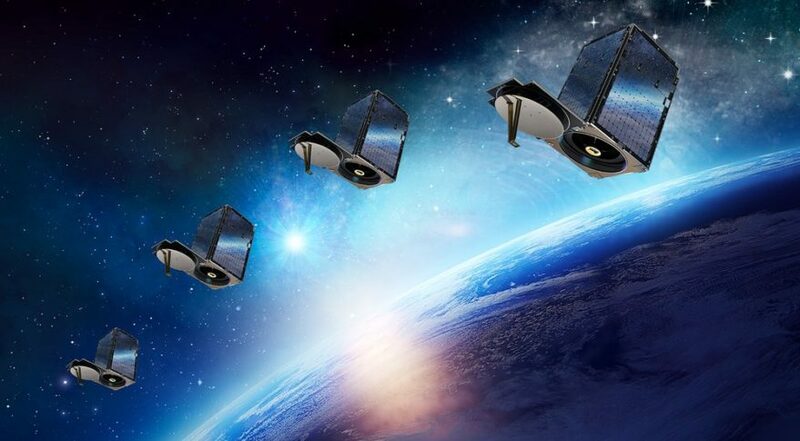 SSL is building the satellites, which will have a resolution of 30 centimeters and will triple DigitalGlobe’s imaging capacity over the high-demand regions, according to Maxar.